Although geographically small in size, Vermont is big on scenery and tour options. In Northern Vermont, attractions abound in the Lake Champlain Valley and here you will find the most populated city in the state, Burlington, VT. With less than 40,000 people, Burlington is also the smallest U.S. city to be the largest city in its state. On the opposite side of Vermont, explore the Northeast Kingdom, reachable in less than two hours from Burlington. This 2,000 square-mile region showcases some of the state’s most rural, spectacular blend of mountains, valleys and lakes. 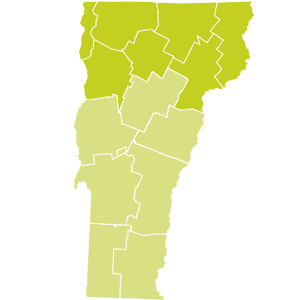 St. Johnsbury is the gateway city to this region. When traveling between Burlington and the Northeast Kingdom, visit the quintessential villages of Waterbury and Stowe where you will find the highest peak in Vermont, Mt. Mansfield, reaching 4,393 feet. Below is a list of northern Vermont attractions.